You save the customizable public properties of a custom control in the ViewState. On the postback, you read those values and reset whatever the UI controls you want to reset. This article looks at a generic way of getting and saving the properties. Any custom control will have a whole bunch of properties – some private and a lot of them public. When you have public properties in a custom control, you (as the control developer) are expecting the Page developer (the one using your custom control) to set them via the Properties box or from the code. Once these public properties are set, you want to get these values between the postbacks so that you can set them back again. In order to do this, you use the ViewState property. /// The HTML Text in the text box of the AJAXWrite. As shown the above example, you save the property value in the ViewState and when it’s needed, you get it back from there. The above code can be made generic as the functions shown below. This is how AJAXControlToolkit gets and sets the public properties from one single place. /// Returns the property stored in the ViewState. 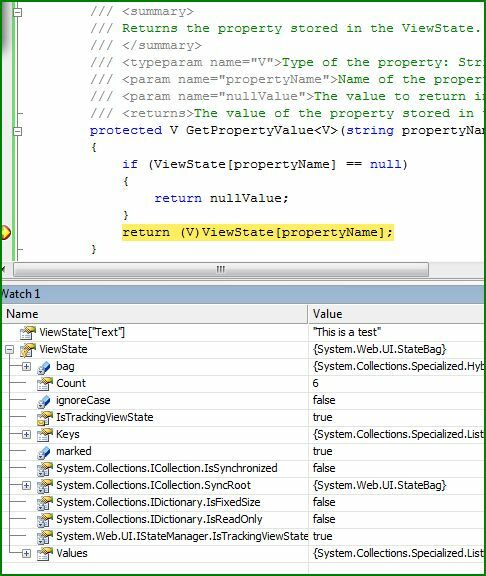 With the above code, you don’t have to explicitly check for null value in each of these public properties. You can pass a value to the GetPropertyValue method to return back in case the property is null. The above generic functions take type-insensitive – meaning, your property can be of any type – String, Integer, etc. If you look in the AJAXControlToolkit, you will also find separate functions for storing string, int, and bool property values in the ViewState. However, it is advisable not to use this – instead use the generic function directly.